I have been working at one of those put-it-together-yourself shoddy desks since I moved into my apartment last summer, because it was cheap and I needed to use my money for things that were more essential at the time. But writer friends sometimes talk about their desks and I’ve always felt like I wasn’t a real writer because my desk totally sucked. 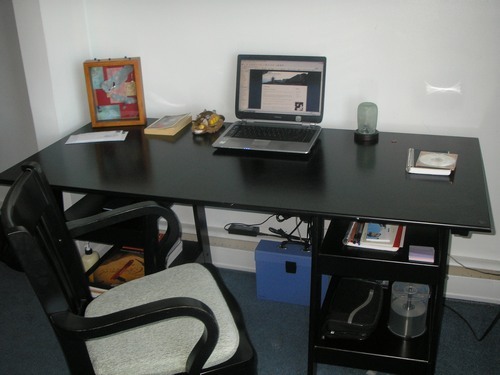 Today I got a really great desk and chair that I’d been eyeing for the past few months, waiting for it to go clearance (because I am a total bargain shopper of nice quality things). I have about four times the desktop space now, and on top of that it looks really nice. I am pleased. 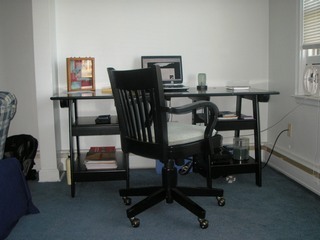 With this desk and chair I can now brag about my desk like a real writer. Do you have any thoughts on why writers can’t tell if their own writing is any good or not? I mean, I think there are probably some writers who do know (or believe) that their writing is good, and there are probably some writers who do know (or believe without any trouble) that their writing is bad, but I think it’s more universal to hear writers talking about not really knowing if something they’ve written is any good or not, don’t you? I feel compelled, probably culturally so–following the hand me down line that’s usually used for questions like this one–to say perhaps not being able to see one’s own writing in a very clear light is like it is to be human, not being able to see ourselves as others see us, from the outside, except perhaps in small glances here and there. I confess some days I read over something I’ve written and think, I really like this. I’m surprised that it’s something I’ve made. Then there are days when I might look at that same thing and think, this is dreadful, this is horrid. How could I have let myself make something so bad/ugly/awkward/boring/shallow? The worst thing about all this is not knowing which of these evaluations is true, or thinking perhaps both are. That’s an even worse thought for me. But perhaps it’s correct. Maybe our best stories are still, in the long view, just more scratches on the cave wall, and if there is beauty in them at all it is not in the product but in the story that the story tells, the one under the surface of what’s written, that someone made this for some reason, stepped away from the business of living and gave a portion of their time in living to make something that might be around for someone else to stumble across now or years later and know that they haven’t been alone in all of this…this thing we’re doing here in the world. I think about that, but then I think that’s perhaps too forgiving and seeing everything in its best light. I think maybe I’m probably really only forgiving of things that’ve been made with a certain earnestness in the quality of their final shape, despite whatever flaws they may have. But less forgiving of things that may be mostly flawlessly made but not meant to be much of anything at all, other than perhaps a comfort fiction, as it’s being called these days. That’s another thing that’s been on my mind lately: consolatory art. What these days, in the speculative fiction field at least, is being called comfort fiction (at least sometimes, I think, by some people who see consolation and comfort as one and the same thing). I think the rise of the comfort fiction brigades has done some damage in its crusade to rid the world of fantasies that lie to us about the nature of living in various ways (and not good lies, not ones that are really truly helpful to us, so I sympathize with what they’re saying about those in that way). But I do think that to a certain extent there’s been a sort of confusion made at times of two different sorts of writing that are separate things altogether, for me at least. One of these I think of as wish fulfillment stories, which are the ones that lie about the nature of our lives perhaps. The other I think of as consolatory stories: stories that can console while still telling the truth. I think that’s possible. 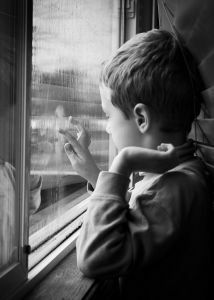 To tell the truth and still find consolation in something. Not comfort, but consolation, something to go on, to feed and keep the spirit while we’re here for a little longer. Not to insulate us from the horrors of living here, but to stoke our fires and keep us going on despite the wolves howling at the door. Not totally accurate on all counts, but fun nonetheless. You tend to pursue many different activities simultaneously. When misfortune does happen, it doesn’t actually dishearten you all that much. You are a thoughtful and cautious person. You like to think about your method, seeking to pursue your goal in the most effective way. You like following the rules and being objective. You are precise and meticulous, and like to evaluate decisions before making them. You have a sunny, cheerful disposition.